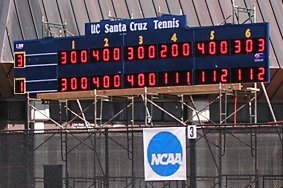 Scoreboards-US was selected as scoreboard manufacturer to host the 2005 NCAA Tennis Championships for Division III. Known in the LED industry as a leader and pioneer in electronic video displays and electronic scoreboards, with over 13 years experience. 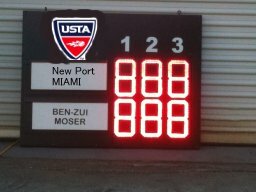 We have outdoor installations around the world and in Central and South America Our RF wireless Tennis scoreboards have many standard features as well as an extended list of available options to make your Tennis scoreboard as customized as you would like. 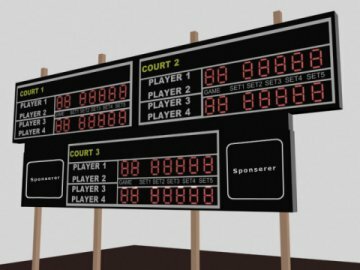 From portable Tennis scoreboards to a full color LED scoreboard, you design it and we will build it. 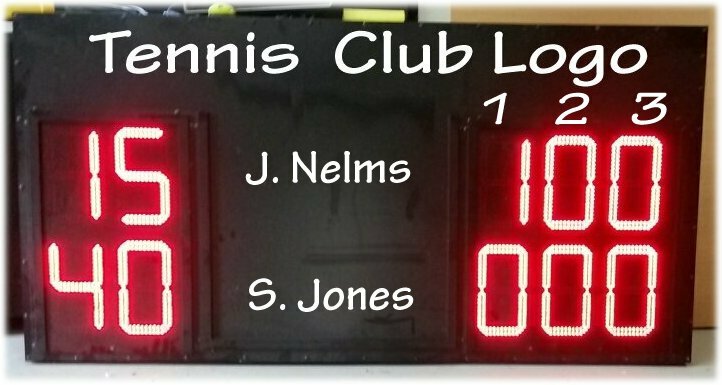 With sales in the US and Europe, as well as many other country's, our LED Tennis scoreboard systems are becoming the standard. 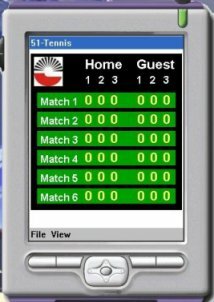 All RF wireless tennis scoreboard models come with our standard RF wireless hand held battery powered color controller, (RF) radio frequesncy model. When 120 volt power is a problem, choose our battery power scoreboard and RF wireless controller controller. 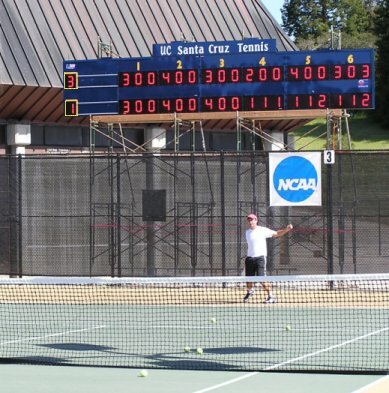 Starting with smaller local leagues, including High schools, colleges and Professional Tennis scoreboards, Scoreboards-us has built Tennis scoreboards for every level, standard and price requirement. 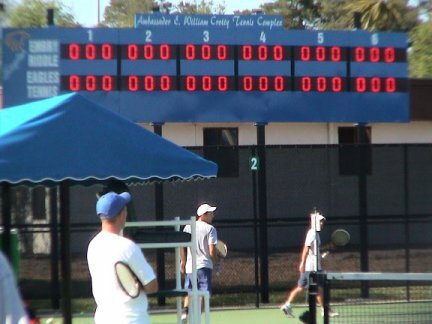 Tennis scoreboard models come as 110, 220 power, battery power and solar power. 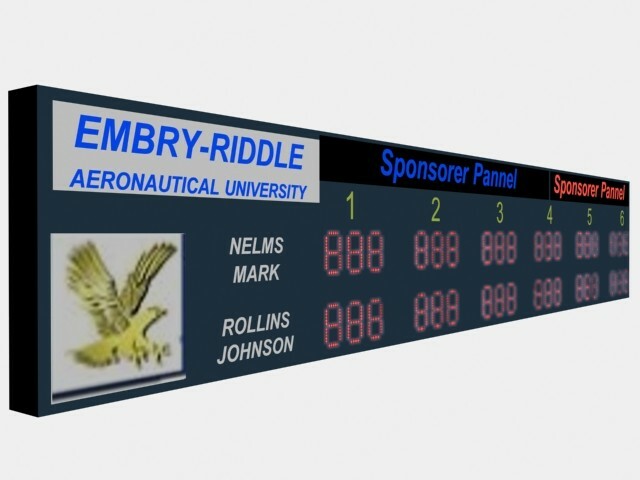 Sponsor Panels--Tennis scoreboard Sponsor panels may be any size and can added to any side of the scoreboard. 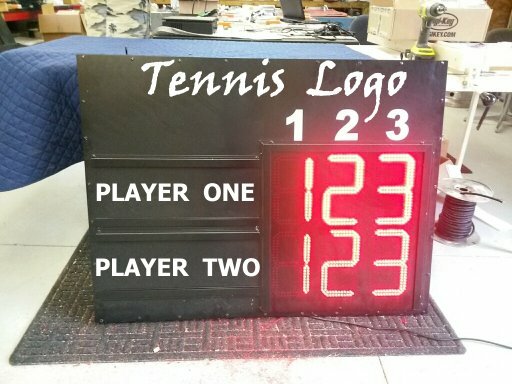 Powder Coat Finish--The finishing touches of our LED Tennis scoreboard comes with quality powder coating. 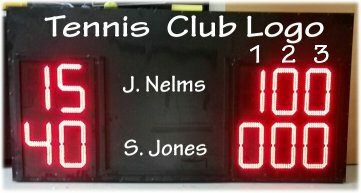 Our wireless Tennis scoreboard LED Digits are bright even in day light games. Custom vinyl logos can be made from your artwork or use our expert graphic designers for that custom design. Need other scoreboards. 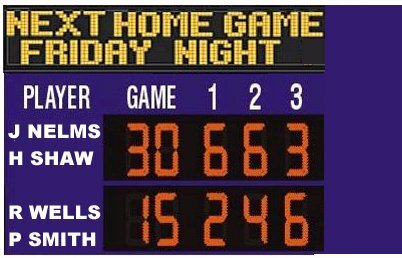 We build Football, Baseball, Soccer, scoreboards to your specifications. We build custom at NO additional cost to you.